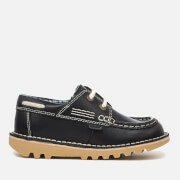 Kids' black leather shoes from Kickers. Crafted with premium leather uppers with a durable, low top silhouette, the derby shoes feature an almond toe, lace-up fastening and hard-wearing rubber sole. Detailed with signature red and green tabs to the sides and MicroFresh® technology lining for optimum comfort. Finished with embossed branding to the heel.